Coal Harbour is a busy place, especially for boats and bikes and planes and pedestrians. The swirling mass of activity is up in the air, in the water, and watching it all from the front row. This is a bunched-together interpretation to capture all the elements seen in a high up Coal Harbour view. 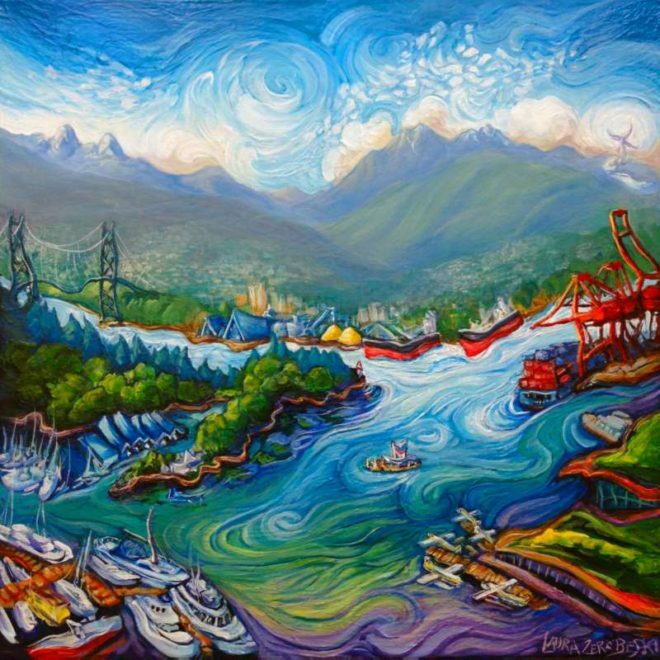 On a bright day, you see the marina full of boats, Stanley Park with its carefree seawall, the Lions mountains and the Lion’s Gate Bridge, the North Shore, and all the industry that serves Vancouver as well as cargo ships, cranes, float planes and green rooftop buildings. Everything is tied together with a breezy popcorn sky and rainbow-swirling water. I wanted to create a scene that is restless, vibrant, and immediate. It’s a view that is vibrant and hard to look away from whether you’re inside looking out or outside looking everywhere.